1. 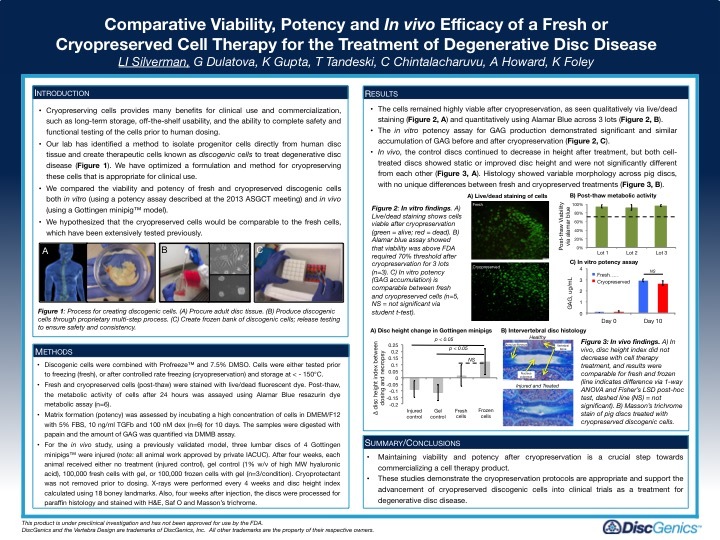 A highly specialized therapeutic progenitor cell that is engineered to uniquely address the complex environment of the degenerated disc. 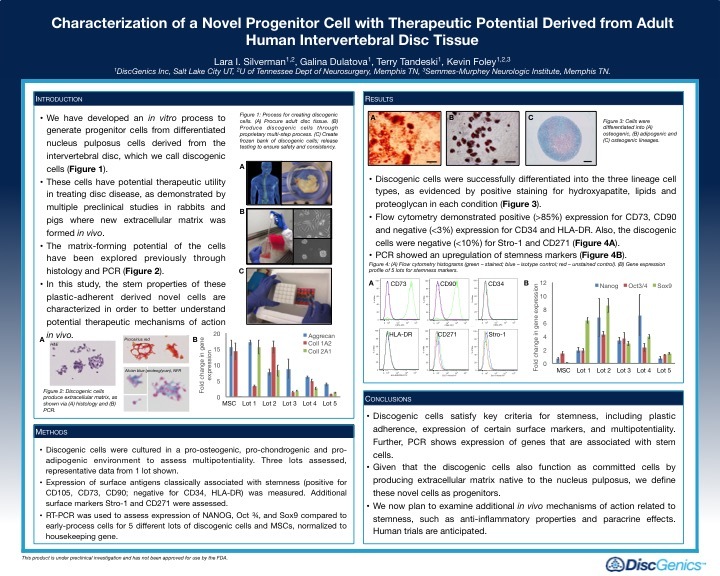 DiscGenics uses its patented allogeneic cell culture manufacturing technology to isolate cells from donated adult human intervertebral disc tissue and drive them back to a progenitor state. The partially differentiated stem cells are then expanded for therapeutic application, combined with a delivery vehicle and cryopreserved for off-the-shelf use. Discogenic Cells are reproducibly manufactured in a cGMP environment and are subjected to extensive testing, including identity, purity, potency and safety evaluations prior to use. To date, comparability has been demonstrated on over a dozen cell lines, with current production capabilities allowing for the manufacture of thousands of doses from a single donor. The degenerated disc is a unique and harsh environment. What sets Discogenic Cells apart from other cell-based approaches? Discogenic Cells begin as disc cells and already know how to behave in a disc environment. They are hypothesized to not only possess the key regenerative and anti-inflammatory properties found in mesenchymal stem cells (MSCs), but also produce important molecules that provide support and structure to the disc. Other approaches that use unspecialized cells from sources like bone marrow or adipose fat tissue must first adapt to the disc environment before even attempting to affect it. The first product candidate to utilize the Discogenic Cell platform is IDCT. 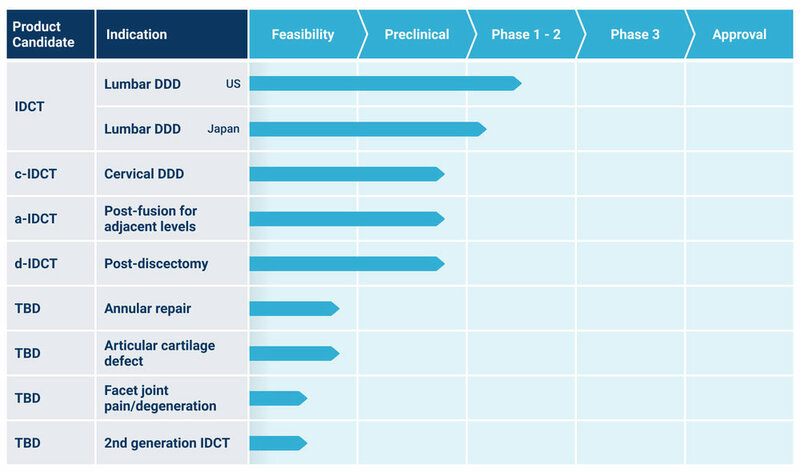 IDCT is an allogeneic (donor-derived), non-invasive cell therapy that is being evaluated in a Phase I/II clinical trial for the treatment of patients with mild to moderate lumbar DDD. During treatment, a single dose of IDCT is injected into the painful disc percutaneously (non-surgically). Based on preclinical experience with IDCT, we hypothesize that the result will be reduced pain and disability caused by inflammation within the diseased disc. Animal studies across various species have consistently demonstrated that IDCT is safe, shown to be bioactive upon implantation, and is well retained within the treated disc. DiscGenics’ cell isolation and manufacturing process is protected globally by 24 issued patents and 15 additional patents pending, and is trade secret protected. 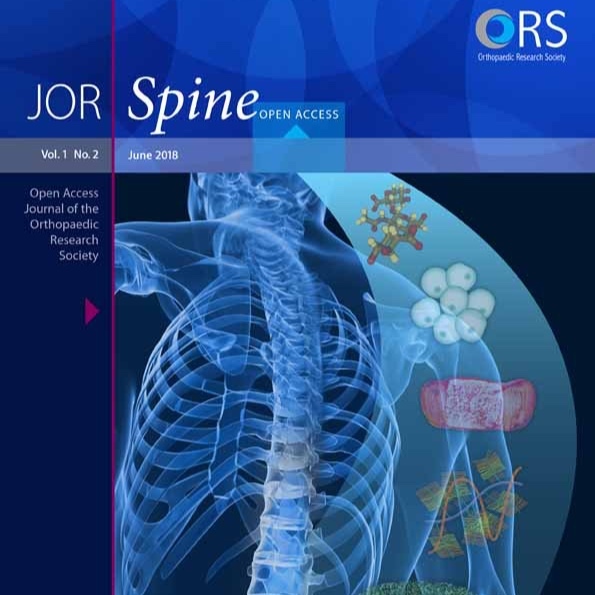 Presented at the Orthopaedic Research Society (ORS) 2019 Annual Meeting. Presented at the Orthopaedic Research Society (ORS) 2018 Annual Meeting. Presented at the Orthopaedic Research Society (ORS) 2016 Annual Meeting. Presented at the International Society for Stem Cell Research (ISSCR) 2016 Annual Meeting. 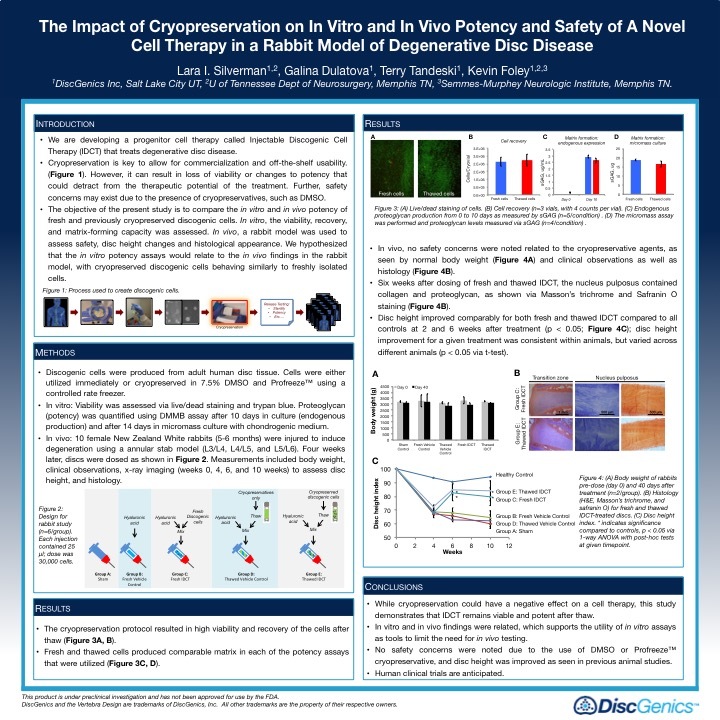 Presented at the American Society of Gene & Cell Therapy (ASGCT) 2015 Annual Meeting. Presented at the Orthopaedic Research Society (ORS) 2015 Annual Meeting.